On September 15th the South Shore Estuary Reserve, the Peconic Estuary Program and the Long Island Sound Study held the inaugural Long Island Estuary Day at the Seatuck Environmental Association in Islip, New York. The event showcased the work being carried out by the estuary programs and highlighted the State’s ongoing efforts to preserve and protect the health of these natural resources. The theme of this year’s event was nitrogen pollution. The event educated the public about what they can do to help keep estuaries healthy, such as upgrading septic systems, using environmentally-friendly lawn care techniques and planting more native species. A variety of family-friendly activities took place throughout the day, including education lectures, workshops, hikes, crafts, and a beach cleanup at the Town of Islip beach. Some of the organizations participating in this event included the Long Island Regional Planning Council and the Department of Environmental Conservation for the Long Island Nitrogen Action Plan, The Nature Conservancy, Long Island Native Plant Initiative, Long Island Invasive Species Awareness Area, Suffolk County and Seatuck Environmental Association. 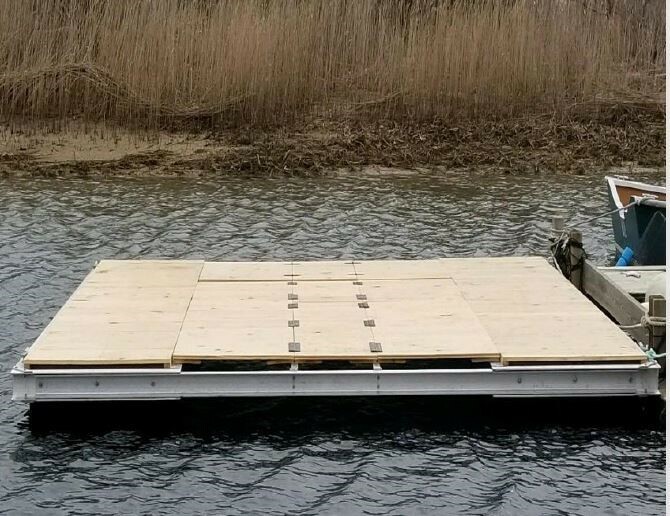 Four Floating Upwelling Systems (FLUPSYs) were installed in the South Shore Estuary ReserveFLUPSYs2 as part of the Long Island Shellfish Restoration Project (LISRP), an initiative announced by Governor Andrew Cuomo in September 2017, designed to improve water quality, help shellfish populations, and strengthen the resiliency of coastal communities. FLUPSYs are used to grow shellfish in open water while protecting them until they are large enough to survive on their own. The units provide increased water flow to ensure a constant food supply and promote accelerated growth. Once the clams reach the size of approximately a quarter they will be transported to one of five Long Island sanctuary sites located in Shinnecock Bay, Bellport Bay, Huntington Harbor, South Oyster Bay and Hempstead Bay. Congressman Lee Zeldin announced $480,000 in federal funding for the Cedar Beach Creek Habitat Restoration Demonstration Project which will restore local essential ecosystem functions in the degraded marsh system. The project grantee, Cornell Cooperative Extension of Suffolk County, will implement this project with New York District of the Army Corps, in coordination with Suffolk County Parks and the Peconic Estuary Program (PEP) to improve this 65 acre marsh, beach, and open water mosaic. The Peconic Estuary Program (PEP) is seeking the public’s input on its Comprehensive Conservation Management Plan (CCMP), which has not been updated since it was approved in 2001. The CCMP is the blueprint to restore and protect the waters of the Peconic Bays. The original CCMP recommended 85 action plans to improve the estuary, addressing issues such as brown tides, nutrients, habitat and living resources, pathogens, toxic pollutants and critical-lands protection. These six priority topics, together with the need for public education and outreach form the basis for the CCMP action plans. PEP will incorporate the public’s input in the new CCMP through an online survey, and is calling upon stakeholders such as business owners, local organizations, experts, government officials and concerned citizens to participate. In addition to the survey, PEP will host public meetings throughout the watershed in the following months. Each year the Long Island Sound Study (LISS) develops a Work Plan as part of the National Estuary Program that outlines the work being done with EPA funds to help achieve the goals of the Study’s Comprehensive Conservation and Management Plan. The 2018 Long Island Sound Study National Estuary Program Work Plan describes LISS activities planed with 2018 federal funding for Oct. 1, 2018 to Sept. 30, 2019. It also highlights projects undertaken from Oct. 1, 2017 to Sept. 30, 2018 with 2017 federal fiscal funds.